Foodismyzen.com was/is the foodiszen.com….ooooppppssss. I might have forgot to share that when I moved to WordPress. BTW..looking at moving again????. It’s been a couple of weeks since I have been to the Farmer’s Market and guess what? We’re still eating what’s left of the produce and drinking the Milk I had bought. Can you say the same about the Produce and Milk you purchased at the Chain Grocer? Pictured: Red Onions ($1.50 a lb. ), Heirloom Cherry and Grape Tomatoes ($5 for 2 berry baskets), in the Bowl: Plums, Heirloom Tomatoes and Asian Pears ($2.79 a lb. 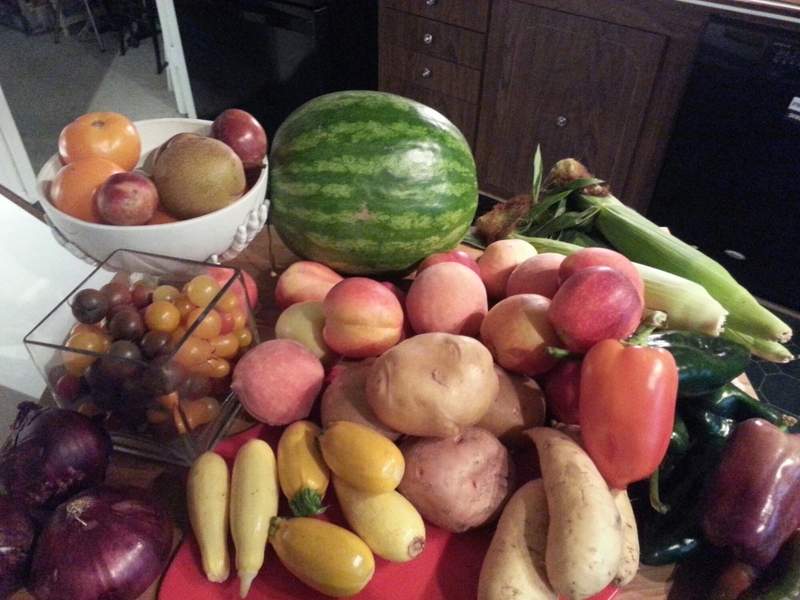 ), Seedless Red Watermelon ($4), Peaches, Nectarines and Apples ($2.79 a lb. ), Corn ($5 a dozen), Poblanos, Sweet Peppers($1.50 a lb. ), Yams, Potatoes and Summer Squash($1.50 a lb.). I spent less than $50 including the $7 for the Gallon of Fresh Milk. Don’t balk at the Milk price it is Milk nothing but, and it lasts well over 2 weeks in the Fridge. Well worth every cent. From what I understand from the Owner is that she has heard from people who have a Lactose intolerance are able to use her Milk and some are able to eat her Ice-cream. Something to think about when are making your food decisions solely by the best price???? FYI: I’m not Lactose intolerant. So, all I can share with you is what the Owner of the Dairy shared with me. I’m still around. Life seems to have gotten in my way lately. It’s an extremely hectic time of the year for me at work. You know that 9 to 5 gig? Still juggling 2 households. I won’t go into that rant for now. I have been doing a little creating in my room and then realizing I forgot to take pics. My Kid made an absolutely yummy looking creation out of one of the dinners I made.I once again forgot to take a pic. But, you know what all in all everything is good. We are happy, healthy and going a bit nuts:) I have a hard time right now hearing about family members vacations and playtime. I want to go play……in time. 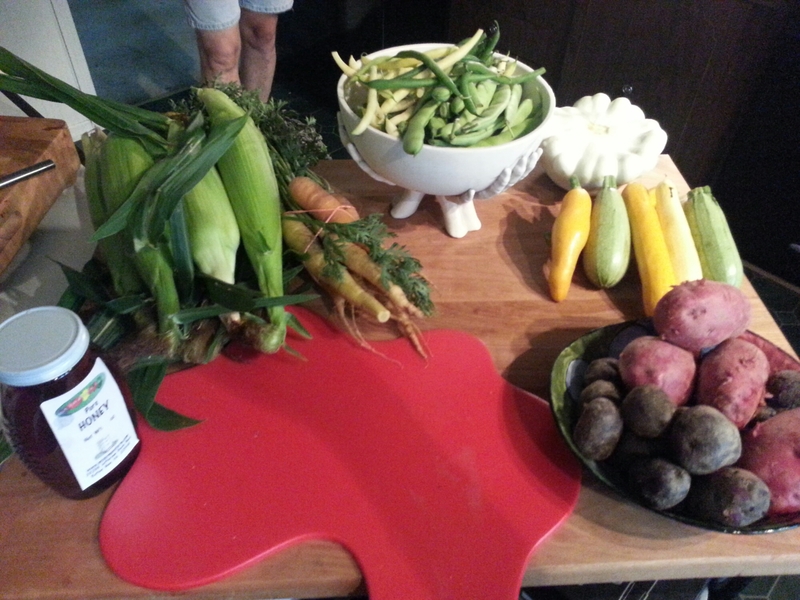 Local Honey (a necessary purchase $15), Corn(YUM) (3-$2), Carrots ($2 a bunch), Italian Beans, Pole Beans (green beans), Wax Beans($2 a lb-Beautiful Yellow Beans), Summer Squash (I think I am going to stuff the large White Patty Pan with Sausage, Garlic, Peppers and ???? Kinda like a Stuffed Pepper) and Potatoes. FYI: I have a Rant……..!!!! !